This spectacular image of the supernova remnant Cassiopeia A is the most detailed image ever made of the remains of an exploded star. The one million second image shows a bright outer ring (green) ten light years in diameter that marks the location of a shock wave generated by the supernova explosion. A large jet-like structure that protrudes beyond the shock wave can be seen in the upper left. In this image, the colors represent different ranges of X-rays with red, green, and blue representing, low, medium, and higher X-ray energies. 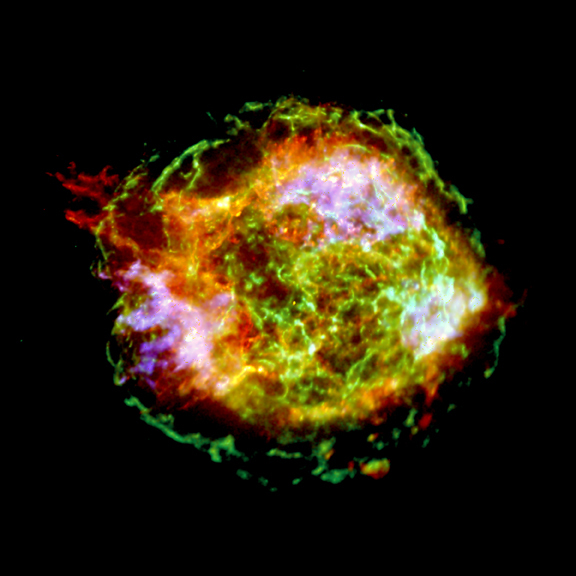 The X-rays in this image of Cassiopeia A are primarily due to silicon ions heated to about fifteen million degrees Celsius, so the ions retain only two orbital of fourteen orbital electrons. This image shows the ratio of the intensity of the X-radiation from silicon ions with two orbital electrons to the intensity of X-radiation at slightly lower energies, which is due primarily to magnesium and iron ions. The image highlights the jet and counterjet traced by silicon X-ray emission. 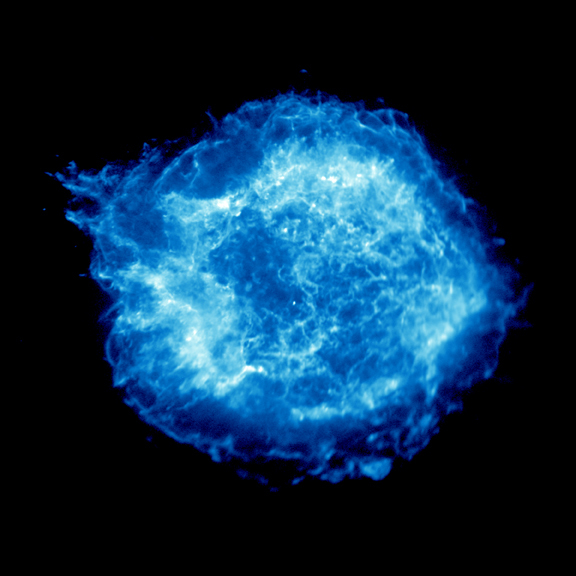 This Chandra image is the most detailed ever made of the remains of an exploded star. The one million-second image shows a bright outer ring ten light years in diameter that marks the location of a shock wave generated by the supernova explosion. A large jet-like structure protrudes beyond the shock wave in the upper left.